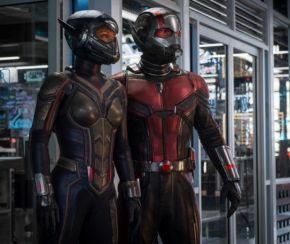 With the Marvel Cinematic Universe (MCU) still reeling from the shocking events of Avengers: Infinity War, it’s great to get a small breather, and they come no smaller than Paul Rudd’s Ant-Man and Evangeline Lilly’s Wasp. Ant-Man and the Wasp is the 20th instalment of the ever expanding MCU and picks up with burglar Scott Lang under house arrest after his involvement during the events of Captain America: Civil War, while Dr. Hank Pym and Hope van Dyne attempt to rescue former Wasp Janet van Dyne from the Quantum Realm. Paul Rudd returns as the shrinking comic book superhero Ant-Man, and also returns as co-writer. He is once again brilliant as Scott, who occupies his time learning close up magic and the drums. He’s a fun and relatable character, and his relationship with his daughter Cassie is one of the highlights of the film. Evangeline Lilly also returns as Hope van Dyne, who finally gets to suit up as The Wasp in a long overdue appearance. In many ways, this is really her film, getting most of the action and the more emotional story arc. Evangeline knocks it out of the park and is truly a welcomed addition to the expanding gallery of heroes on Marvel’s roster. The original Ant-Man, Dr. Hank Pym, is once again portrayed by Michael Douglas, who’s a lot less protective this time around. He gets more to do and he interacts with the rest of the characters in believable ways. He’s played well and adds an extra layer to the film. It wouldn’t be a Marvel movie without an antagonist, and this one provides us with a few. The main one is a character called Ghost, played by Ready Player One’s Hannah John-Kamen, who was recommended by none other than Steven Spielberg himself. While not out to claim a throne or wipe out half of the universe, Ghost is trying to help herself, with the power to faze through solid objects and become invisible. Her motivation is clear and Hannah does a good job, however, she doesn’t have as much presence or threat as some of Marvel’s best. She looks cool and her powers are interesting to see in action, it’s just a shame her character isn’t as good as she could have been. Also on their trail is Tomb Raider’s Walton Goggins, who plays a character called Sonny Burch. He has some good scenes, especially opposite Michael Peña’s Luis, but he doesn’t have much to do and only serves as a distraction for the shrinking duo. We also get to see Laurence Fishburne step away from the DC Universe as Hank Pym’s former colleague Dr. Bill Foster. Though initially a small role, he gets a fair amount of screen time as his character becomes a little more interesting. There’s a handful of other characters who get a fair amount of screen time, including Scott’s team, now known as X-Con, young Cassie and her mother and step-father as well as the first proper appearance of Janet van Dyne. Some have more to do, some don’t but everyone fits the story well. The main story sees Hope and Hank trying to rescue Michelle Pfieffer’s Janet van Dyne from the Quantum Realm, with Scott being dragged back into the fold after experiencing strange dreams after his own journey there. While all this is going on, Hope is being pursued by criminals who want in on their technology, as well as the sub-plot with Ghost. There’s a lot going on with many working parts. The main story is pretty good and provides some of the most emotionally investing moments, the rest are there to create obstacles or set up sequels and spin-offs, including a potential Power Pack movie. The first movie was really a heist film in disguise, but this one doesn’t quite do that. There are still some moments that echo a heist flick, but it doesn’t focus on them, instead being something akin to a road movie, with the characters nearly always on the run or moving from place to place. The action is fantastic, with the Wasp getting the most from them, including a pulse-racing kitchen brawl. Ant-Man himself is a little more bumbling this time, but it makes sense considering the circumstances. Unlike the past few films, Marvel travels back into comedic territory, with this being one of the funniest they’ve made. While not as laugh-a-minute as Thor: Ragnarok, it does have some truly inspired moments guaranteed to make you chuckle. But it isn’t just the humour that brings people in, the effects in this instalment are fantastic and look even better than the first. The CGI is near flawless. Some of the sequences which involve normal scale characters interacting with a giant look slightly off a times, but the interaction is brilliant and more than makes up for it. By this point, Marvel has nearly perfected their de-aging effects, with both Michael Douglas and Michelle Pfeiffer being the recipients. This effect looks amazing and shows how far technology has come, it just needs a few tweaks to be absolutely perfect. The score is once again created by Christophe Beck, who has updated the themes to fit the new movie while keeping it familiar. It works well with what’s playing on screen and sounds fantastic. This film has reinforced that Ant-Man and the Wasp still have the catchiest themes in the MCU. Overall, this is a great pallet cleanser and refresher after Infinity War. The main characters are great and used to their full potential, with the Wasp being a real highlight. It’s a good movie that fans will certainly enjoy. It may not have the emotional punch or as gripping a story as many would like, but it is a fun time and worth seeing. Purple Revolver rating: 4/5. Small but astonishing.